I've played tennis since I was a youngster, so it should be no surprise to hear that I've always loved virtual versions of the sport. Honestly, I think I've played nearly every tennis game that's been released since the early days of the NES. The only exceptions I can think of are the Smash Court games that were released for the PS2, the Top Spin games that have been released for practically every system under the sun and all of the Virtua Tennis games released after the first sequel. 1. World Court Tennis (PC-Engine/TurboGrafx-16, 1989) - A launch title for the TurboGrafx-16, if I'm not mistaken, World Court Tennis deserves a spot on this list simply because it was the first (and last?) tennis game to include an RPG mode. 2. Final Match Tennis (PC-Engine, 1991) - World Court Tennis may be unique, but in truth it isn't a very good game. Final Match Tennis, on the other hand, is a *great* game. It's as pick-up-and-play as you can get (each player has just two shots; typically a flat shot and a slice or a flat and a topspin shot) and it's fast--faster than any other title on this list, in fact. Check it out if you like arcade-style sports games. 3. Super Tennis (SNES, 1991) - If someone forced me to select one of the titles on this list as the *best* tennis game ever, I'd probably have to go with Super Tennis. No other tennis game, in my humble opinion, has been able to match its silky smooth controls--with the possible exception of the eminently playable Wii Sports. 4. Top Rank Tennis (GameBoy, 1993) - If I'm remembering correctly, this tennis game was the first (that I played) that allowed me to create my own player and then take that player to the top of the rankings (hence the title). That alone means it'll always have a special place in my heart. 5. Wimbledon Championship Tennis (Genesis, 1993) - Truth be told, I'm not sure Wimbledon Championship Tennis belongs on this list. I wanted to include a Genesis game, though, and Jennifer Capriati Tennis was an absolute stinker, so I had no choice but to include this solid, but unspectacular, title. 6. 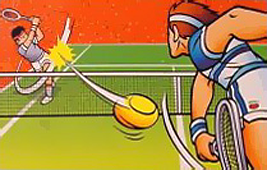 Ace wo Nerae/Aim for the Ace (Super Famicom, 1993) -You know how I said Super Tennis might be the best tennis game ever? Well, Aim for the Ace might be the second best. The only thing keeping it from the top spot is the possibly-seizure-inducing pseudo-3D effect that follows the player around the court. 7. Mario Tennis (GameBoy Color, 2001) - Call me crazy, but I prefer this title to Mario Tennis: Power Tour, released for the GameBoy Advance in 2005. Both titles share a lot of similarities - including an RPG-ish training mode - but I think this one is the more charming of the two. 8. Virtua Tennis 2 (Dreamcast/PS2, 2001/2002) -Virtua Tennis 2 is a lot like a 3D version of Final Match Tennis, mentioned above. It sets itself apart from that and other arcade-y tennis titles, though, by including amazingly deep create-a-player and world-tour modes. 9. Mario Power Tennis (GameCube, 2004) - I decided to include this title instead of Camelot's earlier effort, Mario Tennis 64 (released for the Nintendo 64 in 2000), because, well, this one is better in every way. I know some players hate that you can't turn off the "power shots" (or at least their animations), but they've never bothered me. 10. Grand Slam Tennis (Wii, 2009) - I know what you're thinking: "How can he include this game on the list and not Wii Sports?" My response: Well, as much as I love Wii Sports' tennis, Grand Slam Tennis plays just as well while adding a multitude of other options--including online match-ups. I agree with you, except that you put World Court Tennis at position 1 "just for fun". Final Match Tennis is the best tennis game out there to this very day!